Peck Productions (2017), 56 min. This film tells the intertwined story of Stephen A. Douglas and the American nation from the country's founding to the outbreak of civil war. Born in 1813, Douglas migrated to Illinois from New York in 1833, eager to carve out his future on the frontier. He quickly became a major force in Illinois politics, founding its Democratic Party, and using it as a base from which to ascend to national greatness. By 1846 he had laid claim to one of Illinois' two seats in the United States Senate, where he soon earned national acclaim as the primary architect of the Compromise of 1850, which resolved bitter sectional strife over slavery and possibly saved the nation from imminent civil war. Remarkably, at the age of 37, he stood poised for greatness on the national stage, while his Illinois rival, Abraham Lincoln, toiled away in relative obscurity as a lawyer in Springfield. 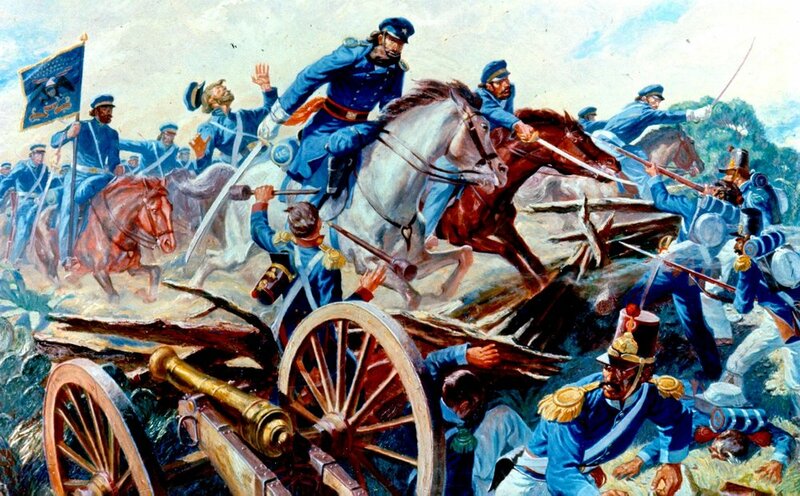 Second Dragoons charge in Mexican War, 1846. Painting Courtesy Wikimedia Commons. Unlike Lincoln, Douglas almost perfectly reflected mid-nineteenth century America's relentless expansionism, unbridled optimism, ardent democracy, belligerent patriotism, and considerable tolerance for slavery. He urged not only a continental empire, stretching from coast to coast, but also a hemispheric one, incorporating Cuba, Mexico, and territory in Central America. He believed that American expansion promoted freedom because it enlarged the reach of the country's democratic and progressive institutions, and hence he unhesitatingly supported war against Mexico in 1846. Assuming that slavery would eventually ebb away, and unconcerned with the fate of blacks, he paid no mind to the prospect of its expansion, an issue that deeply troubled many northerners. Of far greater concern to Douglas was stretching a railroad across the continent and settling the vast territories that lay between the Mississippi River and the Rocky Mountains. An intercontinental railroad would produce incalculable national benefits, annihilating physical barriers that divided the Republic, enabling access to vast natural resources, and opening markets to American commerce throughout the Pacific. Stephen A. Douglas in 1859. Photo Courtesy Library of Congress. However, the volatile mix of expansion and slavery proved tragic both for Douglas and the nation. Indeed, his naively progressive convictions caused him to play the leading role in the sectional drama that tore apart the country by 1860. His tolerance for slavery led him to promote the Kansas-Nebraska Act in 1854--a law that permitted slavery's expansion where it previously had been prohibited--and the consequent backlash in northern states by 1860 brought down the Democratic Party in the North. The subsequent election of Abraham Lincoln on an antislavery platform--as the first Republican Party president--spurred southerners to secede, precipitating civil war. Stephen A. Douglas Tomb. Photo Courtesy John Delano of Hammond, Indiana and Wikimedia Commons. Despite his bitter hostility to antislavery activists, Douglas rallied Democrats to the cause of the Union in the wake of the southern attack on Fort Sumter. Determined to save the Union, Douglas gave his celebrated Protect the Flag speech to the Illinois General Assembly on April 25, 1861, urging all Illinoisans to support Lincoln's administration. He died soon afterwards, ravaged by illness and exhaustion, in Chicago, and was buried on a portion of his estate Oakenwald, where his tomb now sits. 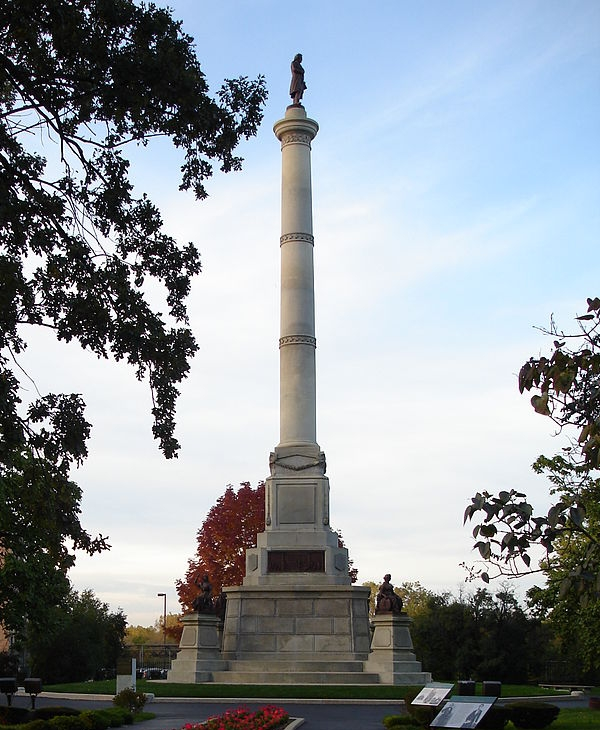 Artist Leonard Volk designed the massive monument, which was completed in 1881, and featured a 10-foot statue of Douglas, facing east, standing atop a 46-foot column of marble. "Brings vividly to life the story of Abraham Lincoln's chief rival and one of the most important American politicians of the nineteenth century"
"An unusually thought-provoking documentary that reveals Stephen Douglas's and the nation's terrible dilemma over slavery, democracy, and expansion. Peck has synthesized image, words and ideas in a meticulously accurate historical production that charts the nation's course to fragmentation"
The Sale. 1863. Lithograph Courtesy Library Of Congress. The film invites a conversation about how history is crafted, communicated, and comprehended. Academic historians mostly analyze texts in order to understand the past, and then communicate their understanding via scholarly argument in books and articles. Yet most people absorb history by learning from others, attending reenactments, watching plays, visiting museums, playing video games, and watching documentaries and feature films. These approaches to the past are far more personal and immensely more immersive. By engaging the senses, almost always sight and sound, and sometimes touch, taste, and smell, they literally bring the past alive. Hence the film seeks to captivate people interested in history by situating viewers in Douglas' world. But it also seeks to tell a sophisticated story about America and democracy. Douglas' life encapsulates the history of nineteenth-century America in many respects, not least his remarkable journey to the West, where he rose from obscurity to eminence, but most significantly in his efforts to balance the tension between democracy and slavery in antebellum America. Although avidly democratic, convinced of democracy's progressive character, Douglas' commitment to a white man's republic ultimately compromised his ideals--and almost destroyed the country he loved. His political career was thus the Civil War writ small, yet he was far from alone. Most white Americans perceived their country as a beacon of liberty in a world of tyranny, or what Lincoln later called the world's "last, best hope" for mankind. By addressing this profound contradiction at the heart of the American experiment, Stephen A. Douglas and the Fate of American Democracy forces a reconsideration of how Americans think about democracy today, reminding us of its inherent limitations and problems as a form of government, which are evident both in this country and around the globe. The film thus seeks an audience of anyone who wishes to understand the implications of self-rule, now more than ever an imperatively important subject of study. For those interested in the nexus between scholarship and public understanding of history, I put together a public symposium for the film's premiere at Saint Xavier University in 2014. Titled Visualizing the American Past: Remembering Stephen A. Douglas in the Age of Ken Burns, it brought together professional historians, a community historian, teachers, reenactors, and filmmakers. For a related podcast that discussed how history is created, consumed, and understood in a digital age, click here.